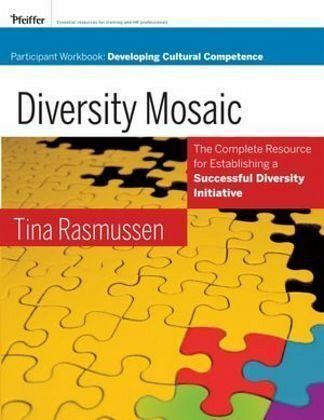 The Workbook is designed to help each employee understand his or her own perception and awareness of workplace diversity and effectively leverage the benefits of diversity through using the Diversity Mosaic Process and Cornerstone Principles. Designed to help employees in all positions and areas of an organization develop knowledge, awareness, and skills for valuing diversity and creating a truly inclusive environment, this workbook will also help you understand your organization's diversity initiative and your role in supporting it. Upon completing the workshop, you will: * Understand and value diversity. * Appreciate why cultural competence is important for you as an individual. * Discover why your organization is undertaking an effort to create true inclusion and to value diversity. * Analyze your own perceptions, strengths, and developmental areas in becoming a champion of diversity. * Learn skills to increase your level of cultural competence. * Determine how to help eliminate structural inequality to create a truly inclusive organization. * Create a personal diversity action plan. This Diversity Mosaic Participant Workbook includes everything each employee needs to know to increase awareness and make the most of the diversity initiative: 360-degree assessment, instructions for assessors content, template letter, perforated observer forms, and scoring sheet. Degree Assessment Instructions for Observers. Cultural Competence: Assessment Form for Observers. Cultural Competence: Assessment Form for Observers. Cultural Competence: Assessment Form for Observers. Cultural Competence: Assessment Form for Observers. Cultural Competence: Assessment Form for Observers. Cultural Competence: Assessment Form for Observers. Cultural Competence: Assessment Form for Observers. Cultural Competence: Assessment Form for Observers.